Without resilience suicides will continue to rise as disruption continues to grow, more people die from suicide than murders, wars and natural disasters collectively, costing the US alone $69B annually. Research has shown that more GDP does not translate into more wellbeing. So more money isn't the answer either. I believe the problem lies in the quality of our thinking. The common dependency on external locus of control and the stigma attached to failure which inhibits better self-care, is literally killing us. Born out of our schooling and societal norms, failure is a bad thing but until we can question this for ourselves and see that overcoming these obstacles through better thinking we as founders and as a society will never learn, grow and transcend the limitations of failure as we understand it today. Failure is a mental construct. It's not failure if you learn something from it. Because of this, I have spent the best part of my last 15 years searching for what I call ‘Founder Resilience’. An internally developed capacity that can withstand the harshest conditions. This is a unique resilience due to two key factors, time and money. There is considerably less time available to founders and there is a finite amount of money. A setback in your business can be more impactful and take you out faster with than a setback as an employee. Fundamentally there is more on the line and this in itself amplifies stress and our ability to build resilience. Resilience is to founders as cash reserves is to business. The problem with our general understanding of Resilience is that its something we build only in reaction to events, I propose that its an asset that we should proactively develop. Until recently we’ve had a very shallow understanding of it and how to develop it. According to Wikipedia: Resilience is the ability to bounce back from a negative experience with "competent functioning”. This is all well and good if you just want to cope but as a Founder we more often find ourselves struggling to get back up off the floor, over time you run out of what it takes to get back up, so how do we build resilience that is not just about coping, but about thriving? I believe it starts with understanding the neuroplasticity of your brain and adopting a better model for building resilience on purpose, enabling advancing despite adversity. Until recently, existing models for developing sustainable resilience had no clear links to neuroscience and were not applicable to knowledge workers such as entrepreneurs, in fact, existing models did not include the relationship between physical health and mindset. Successful founders understand these dynamics, embrace them and build new neural pathways because of them. Thankfully, in 2016 a new model called Predictive 6-Factor Resilience Scale (PR6) was developed by Jurie Rossouw & co. in the International Journal of Neuropsychotherapy that not only consolidated existing research but included how health factors contributed to personal resilience thus enabling a measurement tool and a method to improve personal resilience. 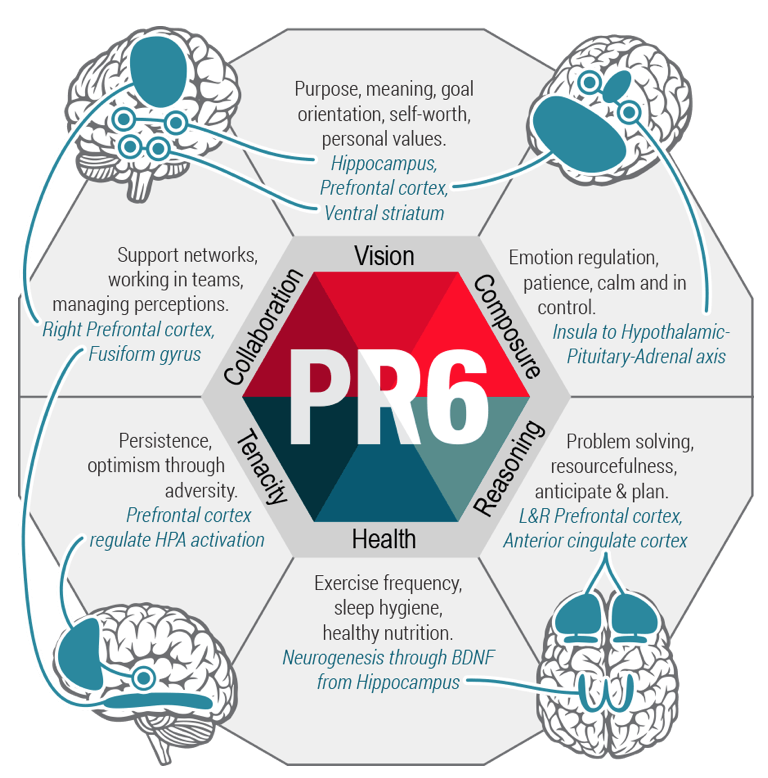 Having adopted PR6 recently, I have been astonished with its impact on me. On top of my already developed capacity for resilience, I have found understanding the neuroscience behind resilience has helped me better understand, adapt and commit. The more I practice resilience the more my brain is wired to overcome the downsides of an emotional reaction in the moment. Mitigating risk of longer-term damage to my business. In short, the first key domain, Vision disproportionally affects all other domains, without a clear and meaningful purpose or long-term goal the rest of the domains are weakened. From there the right amount of Composure will provide constructive energy when you need it the most, typically our impulsive brain takes over when we have bad news, learning to regulate our reactions is core to this domain. In turn, this affects our Reasoning, the ability to use the whole brain to think our way out of difficult situations, this in turn, builds confidence. Tenacity builds due to a conscious decision not to give up and our willingness to stay hopeful despite setbacks. Collaboration enables support networks, our mirror neurones won't fire if we remain isolated due to depression, affecting our confidence and ability to solve our way out of adversity. Finally, Health is key, poor health affects the brain. Recent research has shown that the hippocampus produces a neurochemical called brain-derived neurotrophic factor, its role is to help existing and new neurones to thrive and connect. This is critical to the brain's ability to learn new skills and adapt to new environments. So as you can tell this is a virtuous model, one that requires effort in every domain which in turn becomes a force multiplier for resilience. Fundamentally, there is a battle between the Impulsive brain and the Rational brain, a negative interpretation bias is six times more likely to increase the risk of depression. The last thing any founder needs is depression. The authors didn’t stop there, they also developed a measurement tool, learning platform and chatbot called Driven that coaches you in accordance to the PR6 framework, basically a resilience coach on your smartphone that you chat with when you need it the most, in the midst of adversity. Self Awareness: Start with naming your emotions and objectifying them so that they don’t take total hold of you. We rarely make the best decisions when we are in reaction. Attention Management: Commit to a morning routine that sets up your day on your terms. Practices such as meditation, journaling and only checking emails after 10am are a great start. Peer Support: Attending our Founder Circle’s or creating your own founder peer support group is a great way to share your most painful challenges with other founders to offer solutions and reduce isolation. Pre-meditate on evils: This is Stoicism at its best, by documenting what could go wrong and analysing possible solutions you are better prepared in case they materialise. Check out Fear Setting. Active Listening: This affects your team and your customers when in a conversation repeat what the other person is saying in your mind before responding and jumping to conclusions. Health and Fitness: Regular exercise and healthy diet is paramount to a balanced brain, nourishing your brain is not just about reading about nutrients as well. Sleep Faster: This can be achieved with Deliberate Worry. Schedule time in your furious day to externalise your worries before you go to sleep, enabling the mind to rest easy before sleep. Essentially a practice for setting effective boundaries for our problem-solving mind. Slow Down: Making decisions in the moment rarely nets the best results, allow your rational brain time to process. I like to go 20% slower on Sundays, this trains my brain to slow my cadence. Many investors look for evidence that founders have what it takes to weather the storm of the startup journey and for good reason. The #1 reason for startup failure comes from the founders themselves. High levels of Founder Resilience means you are better able to adapt, play the game for longer and activate a culture that achieves product-market fitness faster. Failure does not exist. It only exists to those who are more concerned with appearing successful. If you give up at the first setback, you will never know if with more time and energy your startup had a chance. If you are clouded by emotion you will be less effective asking for constructive feedback to help adapt your business to suit the customer. A lot of the founder journey finds us in situations we have never experienced before, like raising capital, hiring and firing employees. Building resilience builds confidence that you can learn what you have not yet experienced. There are countless examples of founders who weathered the biggest storms and overcame obstacles due to their resilience. While demonstrating his first product, a device for reading and processing traffic data, Bill Gates couldn’t even get the machine to work. Their company, Traf-O-Data, went on to fail, but provided the foundation for the success of Microsoft’s first product years later. So the question is “Do you have what it takes to overcome setbacks and uncertainty in building your business?” If you don’t today, that’s ok because it's not all bad news, thanks to neuroplasticity you can improve your Founder Resilience. In my experience, the confidence and capacity gained from developing Founder Resilience that I can learn, change and overcome anything has given me more drive in steering directly into obstacles. If you believe that the obstacle is the way and your competitors don’t then your venture is more likely to have first mover advantage. I now hope you can see how this is an internal battle worth striving for. Developing Founder Resilience has become my best investment ever. It continues to pay dividends not only to my founder journey but to my life personally. This post was heavily influenced by the insights in the book Executive Resilience, which details the neuroscience and methodology behind PR6. We run free weekly Founder Circle’s in Sydney and Melbourne, to register for one follow this link and keep fighting the good fight in pursuit of your Founder Resilience.